Implants today are more technologically advanced than implants placed even five years ago, and give many patients the ability to chew comfortably when this was not possible before. While implants have been available for more than thirty years, due to their predictability implants now represent the standard of care for replacing missing teeth. Most studies show success rates better than 95%, and if an implant is well taken care of it should last a lifetime. Dr. Nicole Wright utilizes the most up-to-date technology in planning and placing dental implants. A 3-D scan of the patient’s jaw bone is taken to assess their bone quality and quantity. This scan also helps her see where the important vital structures are (ie- nerves, vessels) and avoid them! In addition to state-of-the-art technology, a surgical guide is fabricated using the scan information. This guide precisely fits the patient’s teeth and assists with the pre-planned positioning of the implant. Utilization of these sophisticated technologies leads to more predictable and successful implant outcomes. Please book an appointment with our dentist Dr. Nicole Wright to see if Dental Implants are the right option for you. 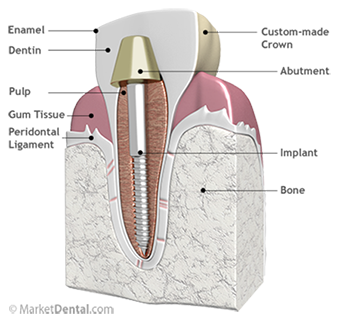 Winston-Salem Periodontics provides excellent Dental Implant services to our patients in Winston-Salem.